David Bowie’s The Next Day, reviewed. David Bowie’s excellent new album is a return to his high ’70s form without being a retread. I once ran into David Bowie on the street in New York City about 10 years ago. He was walking down the Bowery with a hood pulled over his head, avoiding eye contact and moving swiftly, the way famous people do. That same year, I ran into Lou Reed in midtown, Brian Eno at JFK Airport, and Philip Glass on the F train, but none of those moments were as jarring as passing by David Bowie on the Bowery. It felt strange to see him bounding down the street like a normal person. Perhaps the man who fell to Earth was human. Bowie retains a potent mystique, the whiff of übercelebrity. He possesses a certain coolness—in both the cultural sense and the emotional one. Bowie seems less “real” than other classic rock stalwarts, like the Rolling Stones; his slight otherworldliness keeps him intriguing. “My statement is very pointed—except it’s very ambiguous,” Bowie said to NME in 1975. That pointed ambiguity lingers four decades later; at some level, we still don’t know who David Bowie is. The cool distance he injects between himself and his audience is part of his enduring seduction. At his best, Bowie didn’t chase after trends; he helped to create them. In 1977, Bowie was in Berlin with Brian Eno and Tony Visconti brewing strange synthesizer epics and experimental rock songs, not in London where punk was exploding. In the 1980s and 1990s, Bowie jumped on trends with mixed results, in albums like 1997’s drum and bass-influenced Earthling. The Next Day, Bowie’s first album in 10 years, appears Tuesday, seemingly out of nowhere. Instead of releasing a dubstep album to keep up with the kids, Bowie hews close to his classic work in the 1970s without sounding like a retread of the past. The Next Day is the best album Bowie has made since the curiously underrated Outside, produced with Eno and released in 1995. The Next Day is indeed a great album. But the hosannas are a bit surprising, given the limp reaction to Bowie’s previous two rock albums, Heathen and Reality, which were also produced by Visconti. The albums had strong moments but went largely unnoticed. Part of the problem with Reality—an album that was, in part, a meditation on the world after 9/11—was that we didn’t want Bowie’s reality. We wanted artifice, camp, fantastical stories, and soaring anthems. Earnestness and candor are boring; we craved a grander illusion, one that Bowie is so expert at architecting. The Next Day is a propulsive rock album with stronger songs and more drama. Many of the songs on The Next Day are not autobiographical but are tales culled from Bowie’s readings of medieval English history. These age-old stories are often harrowing, visceral: In the album’s title track, Bowie howls “They chase him through the alleys chase him down the steps/ they haul him through the mud and they chant for his death/ drag him to the feet of the purple-headed priest.” Narrating dark tales based loosely on history, or on great works of fiction, is an old Bowie technique: 1973’s Aladdin Sane was full of vignettes, most memorably “Panic in Detroit,” which took its cue from Iggy Pop’s tales of the White Panther party, and 1974’s Diamond Dogs drew inspiration from George Orwell’s 1984. Another reason for The Next Day’s remarkably successful reception is time. After 10 years of silence from Bowie, we craved his presence—not just as music fans but for our culture at large. We missed him, and we wanted him back. The Next Day’s elegiac first single, “Where Are We Now?” is the album’s most personal song, conjuring his storied past in Berlin in the 1970s, the spiritual home of the “Berlin trilogy” of albums (Low, Heroes, and Lodger) made with Eno and Visconti. “Sitting in the Dschungel on Nürnberger Strasse, a man lost in time near KaDeWe,” Bowie sings. His lyrics are loaded with landmarks in space and time: The Dschungel was a well-known club in West Berlin where Bowie, Iggy Pop, and many other famous rockers and artists hung out, and KaDeWe is Berlin’s iconic department store, which outlasted both World Wars to become a symbol of the city in the 20th century. It’s rare for Bowie to sound this wistful about his deep past in a song; Bowie is usually hesitant to discuss his own history. The Victoria and Albert Museum in London is mounting a major Bowie retrospective later this month, and he is not expected to attend the opening. 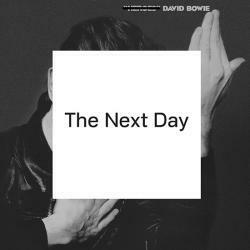 The Next Day offers a tantalizing window into the Bowie of the 1970s. The album is densely self-referential, though many of the references are sonic rather than lyrical. One song ends with the unmistakable shuffle of “Five Years”; another song recalls the swing of “Drive-In Saturday.” “Dirty Boys” sounds like vintage Iggy Pop circa The Idiot—an album Bowie famously produced with Visconti’s help. The cover art, too, travels directly into the memoryscape to the Bowie of yesterday—the angular, black-and-white portraiture of 1977’s Heroes, his iconic face blanked out with a white square. It’s a clever reference not only to the past but to the common perception of Bowie as a blank slate, a canvas onto which his various personas are projected. A sly full-page advertisement for the album in the Guardian last week played with that notion, putting the album cover front and center with the words “Your idea of David Bowie here” written across his face in the white space. But Bowie isn’t a blank slate. Read old interviews and he talks in great detail about his creative process. He’s deeply engaged with art, music, and film—not just as a producer but as a deeply committed fan who can nerd out about Renaissance art, Fassbinder, Buster Keaton, Scott Walker, Kurt Weill. In the 1990s, he moonlighted as an arts journalist for Modern Painters and traveled to Switzerland to interview the late, enigmatic painter Balthus. After nearly 50 years of making music, Bowie, now 66, has shown he still has a few surprises up his sleeve. The Next Day won’t shift any grand paradigms, but it’s a welcome reminder that Bowie still exists, and he’s still working to refine his vision.